Annmarie Skin Care > DIY > What is a Tincture? We often talk about tinctures in our articles about herbs and herbal medicines, so we want to make sure that you know exactly what we’re talking about. An easy way to describe it is to say that a tincture is alcohol with concentrated medicinal plant properties in it. To get a little bit more specific, every type of plant has different sets of alkaloids and water soluble properties in it. The process of creating a tincture pulls those medicinal properties from the inside of the plant and preserves them in a liquid form that we can easily ingest. Most of the time a Western Herbalist will give you a tincture made with more than one herb. Each of these herbs is first made into a simple tincture, then added to the formula with a very specific number of milliliters. Each formula is designed to work synergistically to treat your ailment. Infusion – This is just a fancy word for tea. Pouring hot water over an herb and drinking it is, for most of us, our first experience making our own medicine. This is best for leafy/flowery herbs, like when you make your chamomile/mint bedtime tea! Decoction – If you have ever been to a Chinese Medicine practitioner, they probably gave you a bag of herbs and they probably told you to put them in a pot with water and boil them for 30-60 minutes. You decocted those herbs. This is the best way to extract roots and bark with water. Extract – This is a very basic term that doesn’t have a solvent expressly attached to it. An extract might be made with alcohol, glycerine, honey, oil, or even water. Glyceride – If you have purchased herbal remedies for kids from a health food store, chances are you purchased a glyceride. It’s essentially a tincture made with glycerine instead of alcohol. Acetum – This is a medicinal vinegar. Fire Cider is an example of an acetum. Vinegar is the best at pulling out minerals, so I often add vinegar to alcohol tinctures for an added mineral boost! Medicinal Honey – Just your classic raw honey with fresh herbs infused over time. YUM! I like to grind up my herbs into a powder and add them to the honey and just eat it! Here’s how to make a basic folk tincture. Of course, we can make it more complicated (and we can add math) but it’s always good to start out with the most basic form of medicine making. Are you using a fresh herb or a dry herb? 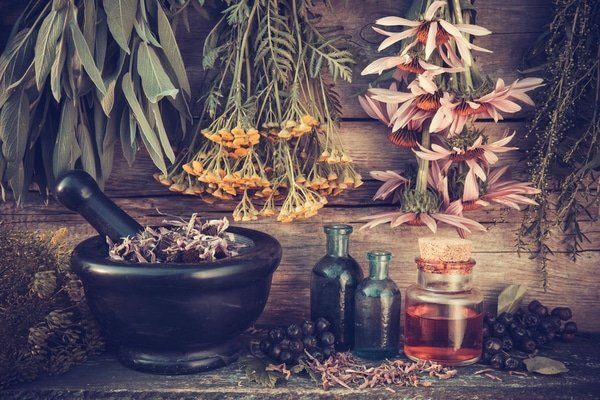 Most herbs can be made into wonderful medicine when they’re dry, but some are only really effective when they’re fresh (like St. John’s Wort), so make sure that you know about your medicine. The alcohol that you use is another important factor. Remember that fresh plants have water in them and dried plants don’t, so your water content will increase when you make a fresh plant tincture. Vodka, brandy, your family’s moonshine—any type of spirits make beautiful tinctures. 3) Pour your alcohol over your herb so that it is completely covered. If you’re using arial parts of the plant, they might float. I like to put pretty rocks or crystals on top of the plant material to hold it down. 4) Let sit for 2-4 weeks. Look at it, talk to it, shake it—make sure you give your medicine attention and love. 5) Strain out the alcohol and compost the mark (the spent plant material). The alcohol has the medicinal properties in it, so that’s your tincture! Note: Some herbs, like reishi, have different constituents that need an additional step for extraction. This goes back to knowing your medicine. 6) Bottle the tincture and keep it in a cool, dark place. Voilà! You just made your own medicine! Make sure that you look up the proper dosage of your tincture and make sure that you don’t give someone medicine that you haven’t tried out yourself. If you’re not interested in using alcohol for your tincture you can always use a different solvent. You would follow the same process, just replace the alcohol with something like glycerin, vinegar, or honey. An alcohol tincture will last indefinitely (if the alcohol content is above 25%) but other types of medicines do have a shelf life, varying from a few months to a few years. Have you ever made your own medicine? Share your recipe below! There are two types of Solomon’s Seal. Here in the West we have False Solomon’s Seal and in the East there is True Solomon’s Seal. You’re right when you say not many people know about it or use it, but it’s a wonderful ally! Unfortunately, it is one of those plants that really needs to be conserved right now and even though it’s a great plant to know in case of an emergency, I would suggest working with other plant allies if you can. OR grow your Solomon’s Seal! A good reference book to learn more about it is Alf’s 300 Herbs. I’ve been healing from Lyme, babesia and bartonella infections using herbs. Stephen Buhner’s books are a wealth of information, for treating these infections and just on general herbal medicine. He also has a list of suppliers. I’ve been making my own tinctures for almost a year now, and its worked out pretty well. I’ve had some slight issues, since a couple herbs Im using would be better fresh but I can only get dried. But the dried herb tinctures work really well. I’ve been using standardized tinctures, with specific amounts of herb and alcohol/water solution. The folk method described above is perfectly valid, but I went with standardized since I’m treating some nasty infections. They do need to be shaken daily and stored in a cool, dry, dark place. Also need to make sure the bottle is mostly full, since they can mold if there’s too much air. Mountain Rose Herbs, Monteagle Herbs, Monterey Bay Spice Company, and 1st Chinese Herbs are all good sources for dried herbs. Alchemical Solutions sells organic pure grain alcohol, which you need to dilute to make dried herb tinctures. Everclear is a pure alcohol vodka, but its not organic. Regarding Herbalism and the various tincture info as well as Carol Tozer’s comment(how does one screen the companies which state organic/non-gmo ingredients, etc.? and I believe we’re all adults, we do not need, nor want any further gov’t regulations). I say that not for sympathy but for patience with questions I might ask that seem silly or obvious. Thank you for kindness in advance. ???? So, if anyone would recommend books, blogs and suppliers(any trusted resources), please email me at [email protected]. (Yes, the Internet is a treasure trove of incredible info but I do not trust myself and my confidence is zeroed…so many choices out there that I get lost and frustrated). So looking forward to finding myself and my steadiness; having always been interested in a holistic lifestyle but none of this mixed with my former life, so blessed now to have found a Blog which resonates within, thank you Annmarie & company! I have been making tinctures of all kinds for many years…. very successfully. I recently bought Echinacea root from my regular herb supplier in Toronto, and did my usual routine,,,,, and it began fermenting, I threw it out… Iuse really good quality brandy…. so I called and told the company, so they sent me a powdered version…. same thing.??? I am stunned, why is this..? ?